neetswriter: What's in a photo? I recently created a board on Pinterest for my novel 'The Grandson'. When writing/ editing, I use photos quite a lot to help visualise a scene. Many of the photos on this board are my own which I've uploaded. When editing my manuscript recently, I got stuck on a scene set in Florence where the hero and heroine are standing on the Ponte Vecchio. I've stood on this bridge a few times, but I couldn't remember exactly what you can see from the bridge. Then I found photos which I took when standing on the bridge a few years ago. Suddenly I could see: rowing boats and a man speaking into a megaphone on a motorboat alongside them; a series of bridges, the next one along with cars driving over it. There were flats with balconies and graffiti on the wall where the hero and heroine would have been standing. The Ponte Vecchio is the only bridge in Florence which wasn't destroyed during The Second World War. 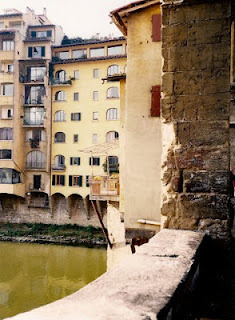 However, buildings at each end of the Ponte Vecchio were destroyed to deny access to it. 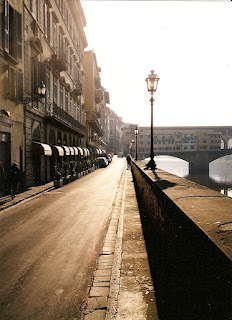 There is a statue of Benvenuto Cellini (1500-1571)-an artist, sculptor and painter-on the Ponte Vecchio. In recent years lovers have locked padlocks to the railing around the statue and thrown the key into the river Arno. There is now a fine for doing this. I spent a few hours once researching Benvenuto Cellini and the padlock story hoping to use it in some way (all fascinating stuff), then I realised I couldn't use it because my novel is set in 1994-before anyone was doing it. Have you created a board for your novel on Pinterest? Do you find photos useful when writing/editing? Lovely photos Anita, and a great idea. My first book was set here in New Zealand and so it was relatively easy to visit the different settings, although one was in South Island, and I took photos for that. My second novel was set in London, and so on a couple of visits (over a few years) I made copious notes of underground/bus/taxi trips, parks and residential areas, but not so many photos. I'll have to use more photos in future as they also help to bring back memories of the event or day. Hi Shauna, thanks for your comment. I think Pinterest can be useful for gathering missing photos. 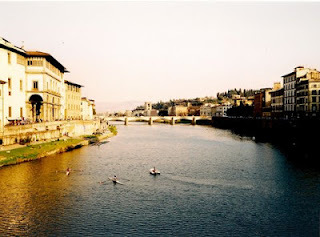 I didn't have a full photo of the Ponte Vecchio (what was I thinking not taking one?! ), so I found one on Pinterest and added it to my board. I keep forgetting to take my camera when I go to London-went last Saturday and was cross with myself! Lovely photo - I like pics of buildings, so evocative. I use photos etc when writing. I'll cut out a picture of someone who reminds me of a character, and pin them up. My ebook cover was a model, who epitomised Annie, my heroine - blonde, slightly aloof and sarky. I use her as my avatar on Twitter. A few people think she actually IS me. Oh, I wish!! Thanks for a lovely read. Hi Carol, thanks so much for visiting my blog and for your lovely comment. I really like the avatar you use on Twitter (and I did think it was you until I met you on Facebook!). I have a scrapbook with photos of characters cut out of magazines-it really helps to have an idea of what the characters look like. I'm still trying to work out how to make the characters in Book 2 different from Book 1-can the hero still have blue eyes?! I love your photos they wet my appetite for your book which I can't wait to read. I think your idea of using them as you write your ok is really good. I don't really understand pinterest but if I go to it I spend far too long there. I'm a visual person so I love photos, Anita - yours are great. I joined Pinterest a while ago but then stopped - must get back to it! Hi Rosemary, thanks for your kind comment. Look forward to seeing more of your pins on Pinterest! I love the idea of having photos on a Pinterest board, Anita. It's gives a wonderful glimpse into the world of your novel. Thanks Liz. I've found it very useful and it's a nice break from writing when I'm stuck on a scene. I am not on Pinterest but then neither am I an author, but it sounds like it works for you Anita, so keep up the good work. Hi Lindy, thanks for your lovely comment. I'm sure you have plenty to do already with all your blogs!